An aerial view of the Rainbow Pier and Municipal Auditorium in 1946. Courtesy photo. People living in coastal communities have a yearning to go farther into the ocean, beyond the natural shoreline. It’s not enough to stand on the strand and look out toward an unseeable distant shore. Like the towers that ancient astronomers erected to get closer to the stars and planets, cities have built piers to extend the beachfront experience out beyond the surf, or in Long Beach’s cases, where the wavelets lap coyly at the shore. The young city opened it to a vote and the pier bond issue passed 120-11 with the $15,000 bond paying for a 1,700-foot pier, the first municipally owned pier on the Pacific Coast. The town’s proud citizens parked their horses and buggies on the strand and promenaded on the pier in decidedly unrevealing beachwear that left literally everything to the imagination. Your could’ve made 70 bikinis out of any one of the ankle-length, long-sleeved outfits favored by both men and women sunbathers who obviously had no need for sunscreen. 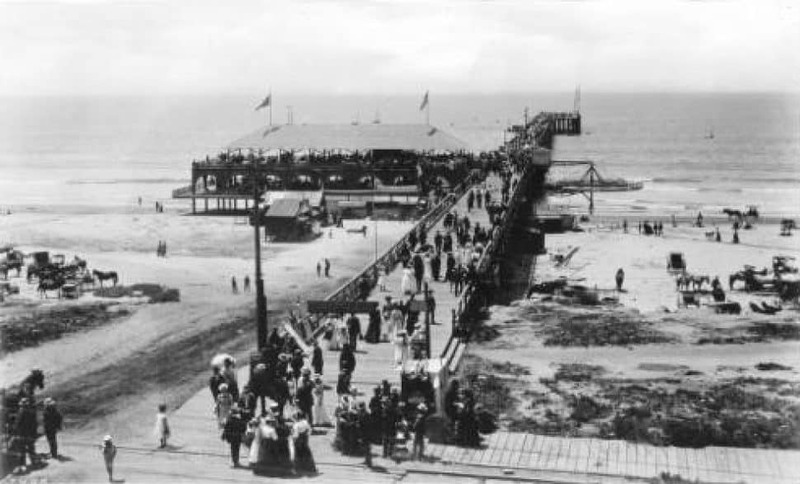 The first Pine Avenue Pier, built in 1893. Photo courtesy California Historical Society Collection. Ten years later, the humble Pine Avenue exploded into the big time and was transformed into an ambitious double-decker pier, with the bottom level for newfangled automobiles, and the top for pedestrians. It sported a huge auditorium that featured daily band performances. It opened in November 1903 with virtually everyone in town showing up to walk out beyond the thunderous breakers to enjoy a slate of opening-day festivities featuring California Gov. George Pardee presiding over a barbecue, yacht races, a football game, a float parade and dancing on into the night. The double-decker was paid for with a $100,000 municipal bond, but the pier turned out to be an expensive property. Buffeted all night and day by untamed waves, it needed constant upgrading, and a freakish Fourth of July storm in 1910 knocked out an 80-foot section of the 1,800-foot structure. That was repaired, but the pier was ravaged again by storms in 1912, causing $25,000 in damage, and in 1919, running up a $14,000 bill. The pier remained for another 15 years before its final remains were swept away by heavy surf in 1934. Meanwhile, the city of Long Beach had expanded toward the east, and residents outside of town in what today is Belmont Heights also hankered for a pier of their own. The Belmont Heights, or Devil’s Gate, Pier opened on Christmas Eve 1915, jutting out into the ocean at the bluff at 39th Place. Unlike the gaudier Pine Avenue double-decker/auditorium, the Devil’s Gate pier was an unadorned walkway out beyond the splash zone. It was also sturdier. It survived its battles with the Pacific for some 50 years and managed to hang on while the current Belmont Pier was being built. The new pier opened in February 1967 at a cost of $1.5 million. And, while the Belmont Pier is perfectly fine, meeting the criteria that defines a pier, it’s nothing compared to the historically finest pier in Long Beach. A Color postcard of Rainbow Pier and the Municipal Auditorium in 1939. 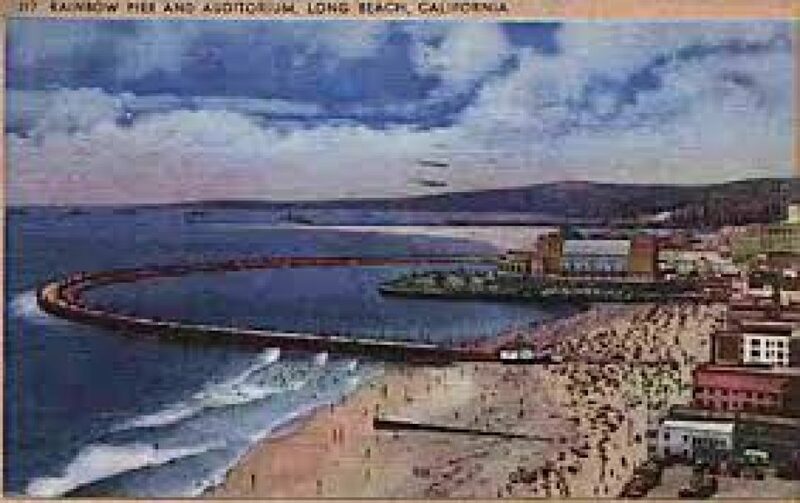 In Long Beach’s dream to become the coast’s premier seaside resort, city planners had dreamed of an arcing (like a rainbow) pier since the early part of the 20th century, but it was a mammoth undertaking and it wasn’t until 1928 that residents approved a bond to pay for the $1.4 million construction cost of the pier. Workers dumped 300,000 tons of granite boulders quarried from the Inland Empire to build the pier’s base, while workers on the beach busily built the Municipal Auditorium, built on eight acres of land that jutted out into the lagoon created by the pier. But, water always wins and by the 1960s, the lagoon had been filled with sand from tidal action and the pier had been weakened by storms. Spelling further doom was the fact that the city was suddenly rolling in oil money and it eyed the property as potential oceanside real estate. By 1966, the lagoon had been filled to make room for the Long Beach Arena, and the Auditorium was demolished in 1975 to allow the construction of the Long Beach Performing Arts Center and Convention Center.